Photograph of the Chamundi Hill temple, taken in the 1890s by an unknown photographer, is from the Curzon Collection's 'Souvenir of Mysore Album'. 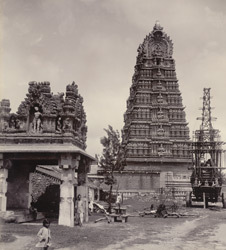 It shows a view looking towards the temple gopura. The caption notes read: ''The temple is held in great veneration by the Maharajas of Mysore. It was built A.D. 1128, and the Maharaja, Krishna Raja Wodeyar III, repaired the shrine and furnished it with a tower in 1827, and in 1848 presented the temple car used in religious processions. The temple is dedicated to the goddess Chamundi...''The Chamundi hill is a rocky hill about two miles south-east of the Fort of Mysore and takes its name from the Goddess Kali or Chamundi, the consort of Siva worshipped on the summit.